1. Ah! What a wonder! 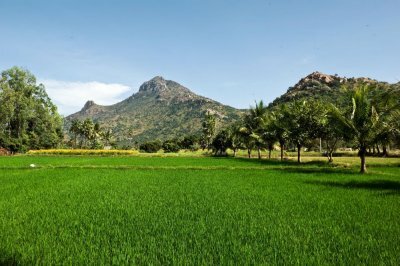 It (Arunachala) stands as an insentient  Hill. Its action is mysterious, past human understanding. 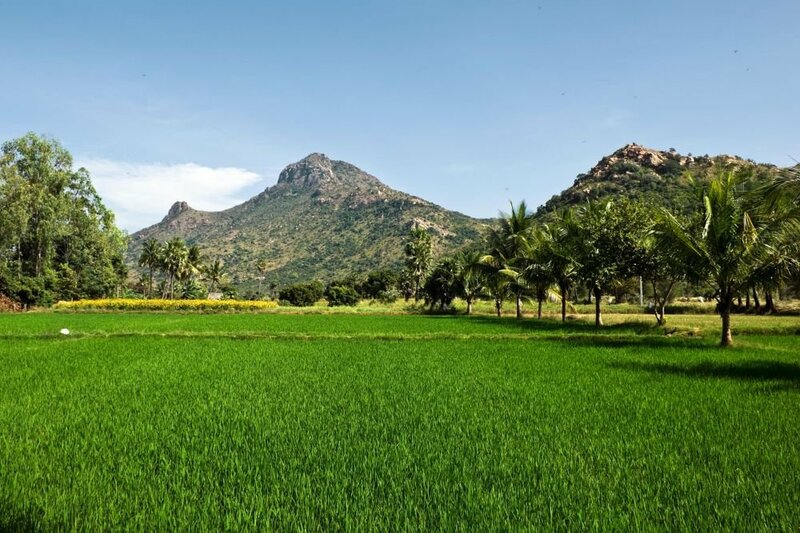 From the age of innocence it had shone within my mind that Arunachala was something of unsurpassing grandeur,  but even when I came to know through another that it was the same as Tiruvannamalai, I did not realize its meaning. When it drew me up to it, stilling my mind, and I came close, I saw it (stand) unmoving. 2. “Who is the Seer?” When I sought within, I watched what survived the disappearance of the seer (viz. the Self). No thought arose to say, “I saw”, how then could the thought “I did not see” arise? Who has the power to convey this in words, when even Thou (appearing as Dakshinamurti) couldst do so in ancient days by silence only? Only to convey by silence Thy (Transcendent) State Thou standest as a Hill, shining from heaven to earth. 3. When I approach Thee regarding Thee as having form, Thou standest as a Hill on earth. If with the mind the seeker looks for Thy (essential) form as formless, he is like one who travels the earth to see the (ever-present) ether. To dwell without thought upon Thy (boundless) nature is to lose one’s separate) identity like a doll of sugar when it comes in contact with the ocean’ (of nectar) and when I come to realize who I am, what else is this identity of mine (but Thee), O Thou Who standest as the towering Aruna Hill? 4. To look for God ignoring Thee who art Being and Consciousness is like going with a lamp to look for darkness. Only to make Thyself known as Being and Consciousness, Thou dwellest in different religions under different (names and) forms. If (yet) they do not come to know Thee, they are indeed the blind who do not know the sun. O Arunachala the great! Thou peerless Gem, abide and shine Thou as my Self, One without a second! 5. As the string in (a necklet of) gems, it is Thou in Thy Unity who penetratest all the diversity of beings and religions. If, like a gem when it is cut and polished, the (impure) mind is worked against the wheel of the (pure) mind to free it of its flaws, it will take on the light of Thy Grace (and shine) like a ruby, whose fire is unaffected by any outward object. When a sensitive plates has been exposed to the sun, can it receive impressions afterwards? O benign and dazzling Aruna Hill! Is there anything apart from thee? 6. Thou art Thyself the One Being, ever aware as the self-luminous Heart! In Thee there is a mysterious Power (Sakti). From it proceeds, the phantom of the mind emitting its latent subtle dark mists, which, illumined by Thy Light (of Consciousness) reflected on them, appear within as though whirling in the vortices of prarabdha, later developing into the psychic worlds and are projected without as the material world and transformed into concrete objects which are magnified by the outgoing senses and move about like pictures in a cinema show. Visible or invisible, O Hill of Grace, without Thee they are nothing! 7. When there is not the I-thought, then there will be no other thought. Until that time, when other thoughts arise, (asking) “to whom?” (will call forth the reply) “To me.” He who pursues this closely, questioning “What is the origin of the I?” and diving inwards reaches the seat of the mind (within) the Heart, becomes (there) the Sovereign Lord of the Universe. O boundless Ocean of Grace and and Effulgence called Arunachala, dancing motionless within the court of the Heart! There is no (longer any) dream of such dualities as in and out, right and wrong, birth and death, pleasure and pain, or light and darkness. 8. The waters rise up from the sea as clouds, then fall as rain and run back to the sea in streams; nothing can keep them from returning to their source. Likewise the jiva rising up from Thee cannot be kept from joining Thee again, although it strays into many paths on its way. A bird (which rises form the earth and) soars into the sky can find no place of rest except the earth. So indeed must all retrace their path, and when the jiva finds the way back to its source, it will sink and be merged in Thee, O Arunachala, Thou Ocean of Bliss. i.e. those who are ever-intent on gaining wisdom. The adjective also bears the meaning eradicating (objective) knowledge. To view Chidambaram, to be born in Tiruvarur, to die in Benares, or merely to think of Arunachala is to be assured of Liberation.’ This couplet is commonly known in the Brahmin households of South India. Alternatively: I realized that It meant Absolute Stillness. Literally: The Sovereign Lord under the shade of a single umbrella.